Andrew (age 6) is very excited about the salad we are going to have with dinner tonight because he picked a bunch of the ingredients. 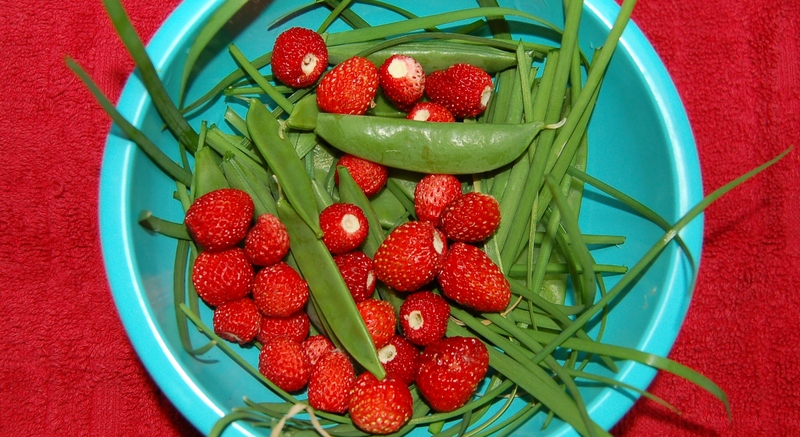 In addition to lettuce, we will be adding the pea pods, garlic chives, and alpine strawberries Andrew picked. I love how having a garden makes my kids eat things they probably wouldn’t if I had bought it from a store. This entry was posted in Cooking & food preservation, Gardening and tagged alpine strawberries, garlic chives, Pea pods. Bookmark the permalink. Mine have been shelling peas all week and they have 1) not lost enthusiasm for the chore and 2) been eating fresh raw peas with delight. Lovely fixins for a great salad! Those alpine strawberries look very delicious. I am waiting for my strawberries to start ripening (some warmer weather would help in that department) but am looking forward to eating them in and on everything – including fresh salads. Cute little Strawberries! I’m regretting not starting strawberries, seems everyone has some this year!